Our workshop tonight was smaller in size but made up for it in spirit, 'tis the spirit of the season. We started off the evening with recognition of one of our young Soaring Eagles who we are very proud of. In recognition of Native American Heritage Month, the Southern California Tribal Chairmens Association (SCTCA) Newsletter sponsored an art contest for Native American youth in elementary, middle and high school. Native American students were encouraged to submit original art or photos that celebrates their tribal culture, traditions, languages, histories or experiences. The winner in the K-5th grade category is Anthony Sandoval Mendoza, a 1st grader from the Yaqui tribe. Anthony is a long-standing member of the Soaring Eagles Dance Troup. As a Grass Dancer, he participates in the local powwows and performs with the Soaring Eagles at events, conference, schools and parades. Anthony also attends the biweekly Soaring Eagles dance class held at the Ballard Center in Old Town San Diego. 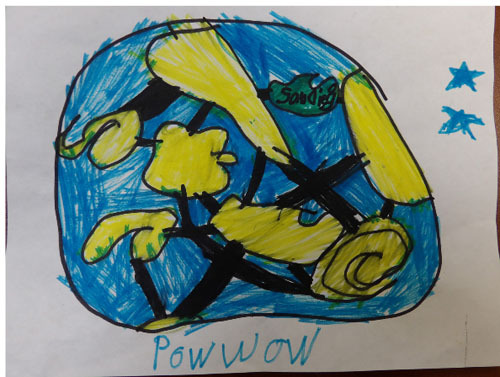 When asked what his picture of Mother Earth depicted, Anthony stated: This is the world, Earth, and this is where we have dance class in San Diego.Anthony and Alyssa (middle/high school winner) will receive a Special SCTCA Award in recognition of their original art works in December. 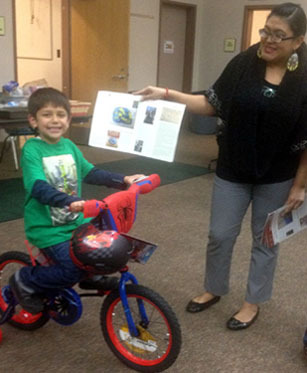 In further recognition he was presented with a $50 gift card and a Spiderman bike! Congratulations, Anthony! The Ballard Center location is in Old Town: San Diego Unified School District, SDUSD at Ballard Parent Center 2375 Congress St. San Diego, CA 92110. We invite you to bring your children and family to learn by observation and participation, a traditional way, the pow wow dance, music and also enjoy the friendship of the gatherings. We continue to appreciate and thank the drum for the songs and all who contributed to this healthy pot luck winter feast. The Soaring Eagles also will appreciate any voluntary donations that will benefit the community potluck feed. This Soaring Eagle dance workshop continues to encourage the continuity of our tribal cultures and is bound up in the wisdom lessons of traditional life. This final month of December is still a good time to review dance regalia and adjust for growth or wear in anticipation of the next pow wow season. Final spiritual message for all my relations at this festive season. May the Creator bless you all and your family, Mehan, Aho.